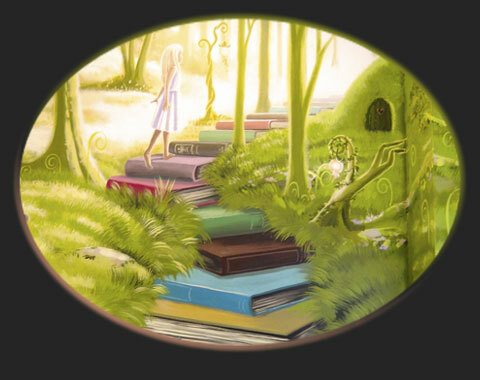 This Primary School Library mural featuring an imaginative woodland fantasy scene with a book staircase that fires the imagination, was painted by hand, directly on to the walls. The work taken to create this library and provide its contents was largely funded by sponsorship, including a local supermarket, and goodwill from local businesses. It just goes to show what can be achieved with a little energy and targeted fund raising. A special well done is deserved for Kate Munkenback Stannard. There are two parts to this work, the woodland walls and the rabbit warren with the bespoke shelves in front. Scroll down to see both in all their splendour. The mural, painted over 4 walls, took ten days to paint. Any quote for similar work would be based upon a similar timeframe for the work, depending on the size etc. ...and if you are a school, hospital or similar or are local to me, you may qualify for a goodwill discount. Woodland Mural helps to disguise some boxy areas and radiators. ...and with the shelves full of books! The idea was that the rabbit warren would be revealed here and there as holes appeared when books are borrowed. The mural, painted over 4 walls, took ten days to paint. Any quote for similar work would be based upon a similar timeframe for the work, depending on the size etc. ...and if you are a school, hospital or similar or are local to me, you may qualify for a discount.